What kind of bonuses can I find on a bingo site? No deposit bonuses are a great way of trying out a bingo site with no risk whatsoever, and play a few games for free to see how it all works before making a deposit. These bonuses are especially suited to those who are perhaps inexperienced, so if you have never played online bingo before then maybe you could try a bingo site with a no deposit required bonus. 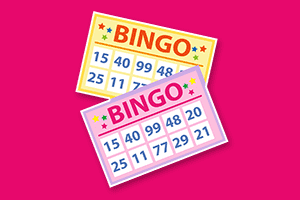 When you sign-up you are credited with a small amount of bonus money so you can buy bingo cards and play a few games. Usually the amount given is between £5 and £15 bonus cash, but sometimes it can be a bit higher. They normally come with some conditions so check them out beforehand. Although you can win money with these bonuses, you will not be able to withdraw the funds or be eligible to win any jackpots (including progressive jackpots). In addition to this, these cash bonuses are only for purchasing bingo cards and usually cannot be used to play other games such as slots or instant games. The wagering requirements prevent you from from withdrawing any winnings made with these free money bonuses. This is to reduce the amount of abuse or fraud. Consult the terms and conditions or ask your Chat Moderador (CM) for more information. In any case it is worthwhile taking advantage of these offers as you have nothing to lose and you can play a few games totally free. They are the most popular bonuses in online bingo, being the first thing that bingo players look for. That is one of the reasons why most bingo sites offer welcome bonuses, as the online bingo market gets more competitive. These bonuses usually give you a extra percentage of your first deposit amount, varying between 100% and 300%, although sometimes it can be higher reaching a huge 500%. These bonuses always have a maximum amount and require a minimum deposit (£5 – £10). For example, if you sign-up on a site with a 300% welcome bonus up to £150 with a minimum deposit of £10, it means that you have to deposit at least £10 to get £30 free and play with £40 in total. However, you will never get more bonus cash than the maximum amount, so it is not a good idea to deposit at once more than £50. Please, read the terms and conditions carefully and check out all the requirements before making a deposit. Perhaps more important than the welcome bonuses and the no deposit bonuses is whether a site offers reload bonuses, which are given on every deposit you make. If you plan to play on a bingo site more than a couple of times then it makes sense to choose one that will reward you for your loyalty; if not there is not much incentive to stay. Most bingo sites do offer reload bonuses; don’t worry because information regarding this is given on our bingo reviews. Reload bonuses tend to be in the order of a 50%, but they can be higher too. So if you deposit £50, you would end up with £75 to play with. Therefore you always get more for your money. Sometimes you will need a promotional code to get special and exclusive reload bonus, so it is a good idea to check out our bingo bonus codes page from time to time to get larger bonuses. With these bonuses you will get back a percentage of your losses in a specific period of time. Generally they tend to be around 10% up to a maximum of £100, but they can be higher. Online bingo sites reward you for helping them to bring in brand new players. For that purpose they usually give you an extra bonus for a limited number of players that you bring to their site. This varies between £5 and £20 bonus funds, although sometimes they prefer to give you up to 15,000 loyalty points. Check out our reviews for more details.